Agoda reveals leading destinations of Vietnamese travelers during National Day holiday from September 1-3. Agoda, one of the world’s fastest-growing online travel agents (OTAs), has released its National Day Getaway 2018 study, revealing that travelers from Vietnam said “sawadee-ka” in Bangkok in droves during the September 1 to 3 long weekend. The nearby metropolis, which boasts incredible shopping, amazing cultural destinations, and one of the world’s most heralded cuisines, along with affordable access and a great selection of accommodation for all budgets, proved too big a draw for Vietnamese to resist this year. 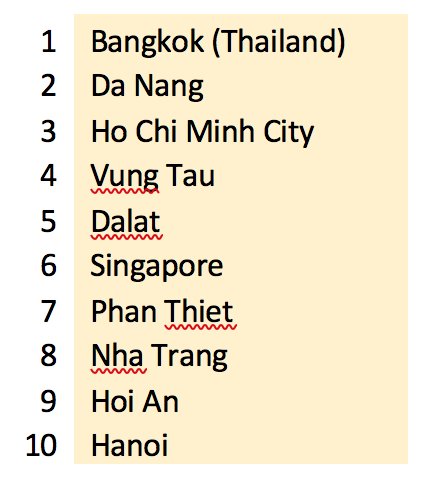 The Thai capital topped the national “top destination” chart, ahead of domestic destination favorites. Travelers opting to stay at home for the last public holiday of 2018 unsurprisingly chose to while away the summer heat at Vietnam’s famed beaches. Residents of southern Vietnam flocked to nearby Vung Tau while both central and northern Vietnamese travelers opted for Da Nang and neighboring Hoi An. Phan Thiet, Nha Trang and Phu Quoc Island continued the beach theme, occupying fifth, sixth and ninth places. The cool-off theme continued with mountain retreats Da Lat (fourth) and Sapa (tenth), while major cities Ho Chi Minh City (second) and Hanoi (eighth) rounded out the country’s top domestic getaways. City breaks dominated overseas destinations. In addition to Bangkok, others that proved popular included Singapore and Kuala Lumpur, where myriad entertainment and cultural offerings coupled with short travel times and visa free entry have seen them become increasingly attractive to Vietnamese families and travelers. Seoul and Taipei were also popular international destinations for those looking to travel slightly further afield.